From eatdrinkpaleo.com, I love the light fluffiness of these pancakes, which I found stored well in the fridge for up to 4 days. I ate them as an afternoon snack with a little tahini spread – they are naturally sweet and delicious. 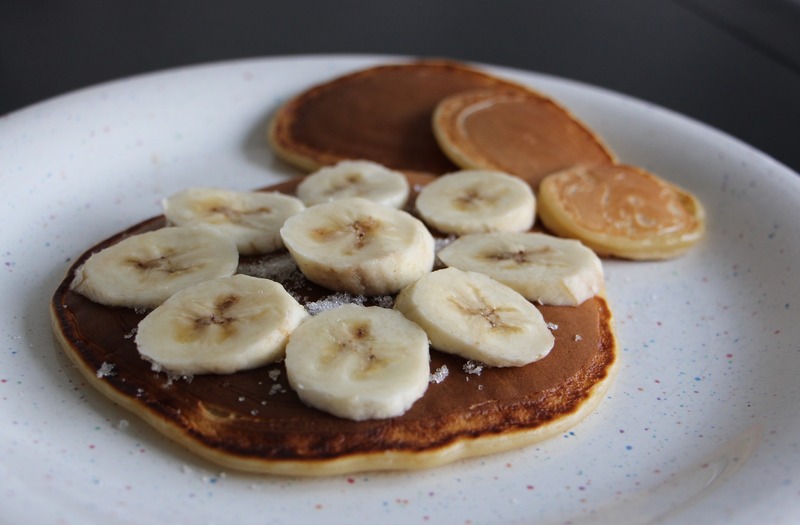 Place all pancake ingredients in a blender and puree until smooth and fluffy. If you don’t have a blender, you can mash banana with a fork and whisk the eggs in a bowl and then combine with the rest of ingredients. Heat up a dollop of ghee or coconut oil in a non-stick frying pan. Cook pancakes in batches, about one and a half tablespoons of mixture per pancake. Keep the heat on medium making sure the pancakes don’t burn too quickly and cook thoroughly. I usually cook mine for 1:30 mins on the first side and for about 1 minute on the second side. You know it’s time to turn them over when little bubbles start appearing in the batter. The batter is quite fragile so use two spatulas to turn them over. Add a little more ghee or coconut oil in between pancakes.